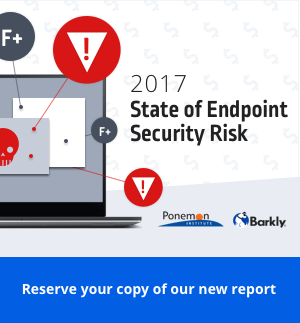 The 2017 State of Endpoint Security Risk Report shows a sharp rise in fileless attacks evading current endpoint security. A new study by the Ponemon Institute finds that endpoint security risk has increased significantly. 54 percent of respondents said their company experienced a successful attack. Of those respondents, 77 percent were victim to fileless attack or exploit. Sponsored by Barkly, the survey of 665 IT and security leaders finds that over-reliance on traditional endpoint security is leaving organizations exposed to increasingly sophisticated and costly attacks. “This survey reveals that ignoring the growing threat of fileless attacks could be costly for organizations.” said Dr. Larry Ponemon, Chairman and Founder of Ponemon Institute. To address the rising threat of fileless attacks, over 50% of organizations looked to replace or augment their existing endpoint security with new tools designed to stop fileless attacks. However, even with the transition to next generation security, organizations cited protection gaps, high false positive rates, and complexity of management as top challenges with new solutions. False positives, for example, were ranked as the most significant “hidden” cost of endpoint protection comprising 48% of all security alerts. With fileless attacks on the rise, and false positives accounting for almost half of all alerts, it is no surprise that only 36% of organizations report having enough resources to effectively manage it all. “Based on this research, organizations need a strategy in place to block fileless attacks, which are responsible for the majority of today’s endpoint compromises. To restore their faith in endpoint security, new solutions also need to address the crucial gap in advanced protection without adding unnecessary complexity and alarming false positive rates to endpoint management,” said Mike Duffy, CEO of Barkly. To see the full findings, download your copy here. See how Barkly’ blocks attacks other solutions miss.